So, today I went to Timisoara to do a couple errands. The two things on my list were to pick up some packages from the customs office, and to cash a traveler's check. Picking up the packages was easy and relatively painless. The traveler's check, on the other hand, was a different story. I had received the check long ago, when I was in Ploiesti for training. It came from a friend in the States. I asked around when I first got it, and no one seemed to know where I might be able to cash it. It seemed no one had ever heard of this sort of check. So, after a while, I stowed it in my luggage and forgot about it. When I came to Lugoj and unpacked, I rediscovered it. Again, I asked around where I might be able to cash such a thing. Again, no one really knew. I talked to Flavia about it, and she made a call to a friend who works for a Romanian bank. Her friend said that some banks might accept traveler's checks, but that it would take 6 weeks before I'd get the money. I thought, well, if this is the way it is, that's fine; I'm not in any hurry. But it sort of defeats the whole purpose of Traveler's checks. So, I went to the biggest bank in Lugoj and showed the check to a lady who dealt with foreign currencies. She looked at it in astonishment, never having seen anything like it before. She called over her supervisor, who was also stupefied. They both wondered over it, as if it were an exotic space rock. I asked if there was anyone in the bank who knew what to do with it. The lady said she'd go talk to the bank director, which took her about 30 minutes. When she returned she said he wasn't sure if they had the ability to process such a check. She said, however, that the large branch in Timisoara would likely be able to take the check. So, I kept the check until today, when I had the free time to go to Timisoara. So I went to the biggest BCR branch in Timisoara. Cameron happened to tag along just for the fun of it (he's masochistic like that). After doing a bit of running around from one teller to another trying to find the right person to talk to, I finally arrived where I needed to be (or at least so I thought). I gave the lady behind the desk a big smile, and handed her the check. She at least knew it was a traveler's check, which was a bit of a relief. In a biggers city like Timisoara, I'm sure they come across them more often. She asked for my passport and visa, and entered the information in the computer. Then the computer asked her to select which type of check it was (Thomas Cooke, American Express, Bank of America etc.). The problem was that mine was a Visa check, and Visa was not one of the selections. Everything seemed to be going so smoothly up to this point, but it seemed we'd hit a brick wall. The lady said she had never seen such a check. I was sort of surprised that they'd never seen a Visa check. After all, the commercials had always told me that Visa is everywhere I want to be. My faith in Visa was beginning to faulter. The lady pulled old a thick, dusty old manual. It contained a list of all the checks they would accept. After flipping a couple pages, she found a picture and description of a Visa check. Phew! She read over the description, and noticed that the check pictured looked a lot different from mine. I was quick to point out that the one shown in the book was a $100 check, while mine was only $50. In fact, mine was a AAA check and the one shown was issued by some other company, but I didn't want to get into some sort of discussion about that. The lady proceeded to read the book's description the security features on a Visa check. She put it through the battery of tests, feeling the check, folding it, holding it up to the light, putting it under a magnifying glass, sniffing it, chewing on it, lighting it on fire...you know the drill. A few other people came by to give it their inspection as well. I guess it passed because next she asked me to counter sign it. But then I got kind of worried because she asked why my signature was identical to my other signature. I explained because I signed both spaces, that's what you're supposed to do. She asked if I had purchased the check, I explained that I hadn't; it was purchased in the states and then sent to me as a gift. She then asked what bank it came from. I explained it doesn't come from any bank, it's a traveler's check...that's the whole deal with traveler's checks. Luckily she read a section of the book that explained the whole thing about counter-signatures, and it seemed we were back on track. She photo-copied everything. At this point I was still expecting it to take 6 weeks before I got my money. However, she came back to the desk and told me I could get my money at the foreign exchange window downstairs. Wow, instead of 6 weeks, it only took an hour and ten minutes! Surprisingly, the lady downstairs wanted to give me money in dollars. I had to actually request for the sum in lei. I'd never thought that would be an option. Anyway, long story not-so-short, I got the money and sighed a big sigh of relief. The moral of the story is, you may want to be wary of traveler's checks when coming to Romania. It seems the bank I dealt with was more familiar with American Express or Bank of America checks than Visa. So be warned on that point; it may not as quick or easy as you might expect. Though, in my case I suppose things were complicated because of my 'weird' check. I guess on the plus side, it didn't take 6 weeks to process as I had originally been lead to believe. But, for the sake of convenience, my suggestion for travelers would be to use a credit card or debit card and withdraw funds from ATMs. I suppose this post was a sort of long-winded way of saying that. I spent the past weekend visiting Zach, my friend and fellow PCV from Sibiu. I arrived on Friday evening, dropped my stuff off at his apartment, and headed out to a bar that had a variety of games and arcades. We ordered a round of drinks, and looked around. There had all the standard games-- foosball, air hockey, basketball, billiards, etc. But there was one thing that really intrigued me, something called the “Party Box.” The most confusing thing about the Party Box was that it did not resemble a box in the least. Zach and I wondered what it could be. Our questions were put to rest when a few large men put some money into the slot and a punching bag dropped down. They wailed their drunken fists against the helpless bag, thereby confirming their aggressive masculinity. The maximum score was 1000, and we saw these guys racking up 700, 800, 985. The dumb competitive male inside Zach and I made us wonder what scores we might be able to achieve. Something told me that by the end of the night our curiosity would probably get the best of us. I was right. Just before we left the bar we decided to try our hands at it, or fists as it were. Zach scored something near 400. I nearly toppled the machine with my earthshaking punch, scoring 138. Victorious, we called it a night. The next day Zach and I took a long walk around town. The last time I was Sibiu, I wasn’t able to take any pictures because I had forgotten a memory card for my camera. So, this time I made sure to take plenty of pictures. Check them out HERE. At one point a well-dressed old man approached us, and tried to scam us (or so it seemed). He said he was with a tour group that had come all the way from Constanta (on the Black Sea). Somehow (he wasn’t really able to explain how) he had gotten separated from his group and gotten lost. He needed to get back to the bus, where his luggage, passport and money were. He complained that his 70 years made walking difficult, and being an out-of-towner, he didn’t know who to talk to. At first he asked us if we knew anywhere he could go to talk to someone. We suggested the tourist info bureau at the city hall. He said he’d been there, and continued to play the old-age card. Then he suddenly asked for money for cab fare. I asked him how he had managed to get so far out of the city in the first place. He gave some sort of hollow excuse. I was just about to ask for his ID (to see if he was really from Constanta) when he gave up on us, and walked off. It was a sunny day, but it was windy and cold. So, if he was telling the truth, I sort of feel bad for him. But then again, his whole story seemed kind of fishy. Plus, if I were in his situation I don’t think I would approach the two people on the street who were obviously not Romanians. Nevertheless, he invested a lot of time in talking to us, time he could have spent trying to find someone more helpful, or at least someone who spoke better Romanian. When we returned home, we decided to make Buffalo wings. Zach’s from Buffalo, so he knows his wings. He had some mix for buffalo wings sauce, something extremely precious to a PCV here in Romania. It was my first time making anything like this, and my first time deep-frying chicken. But, all in all, I’d say the operation was a success. The only thing was that we could have made them a little spicier. On Sunday Zach and I got up late and decided to go to the Brukenthal Art Museum. It was ok, but perhaps a little too heavy on old portraits of rich people I’d never heard of. There were a few interesting Flemish landscapes, and some antique furniture with wood-inlay. Despite our age and supposed maturity, Zach and I entertained ourselves by thinking up comical captions for the paintings. Hearing us talk, one of the curators came up to us and started speaking German. Upon the realization that we didn’t speak or understand German, she quickly changed to English. Following us around, she gave us information about many of the pieces, which was nice. After finishing our tour of the museum, we emerged to discover that it was raining/sleeting outside. While we were walking along, the precipitation got more intense, so Zach and I ducked in a newly-restored Orthodox church to check the frescoes and escape the sloppy weather. After that I boarded the train home. I was pretty tired, and the train car was bouncing and swaying in such a way as to lull me to sleep. I slouched in the chair and dozed off, waking periodically to find little pools of drool had gathered on my shirt. I’m sure the girl sitting across from me thought I was a complete slob. Today was a sunny day, one of three since late October. As you can imagine, I've gotten sick of the grey skies. But, with today's sun I suddenly felt energized. So, I decided to go out and try to get a picture of 'Muntele Mic' (The Little Mountain). With clear skies, you can usually get a pretty good view of it from the town center. So, I grabbed my camera, and a plastic bag (because I had decided to combine this venture with a trip to the grocery store), and made my way out. When I got to the viewing spot I was very disappointed. The skies immediately overhead were clear, but off in the distance they were still grey, and Muntele Mic was shrouded in clouds. It'd have to wait for another day. From there, I thought briefly about heading over to the grocery store. However, something compelled me to go for a walk. The sun was still shining, the air was cool and crisp, and there was a slight easterly breeze. These are the sort of winter days I like. So, I walked, and kept on walking. I headed due east out of the town, to the spot on the river where I had gone swimming in the summer. When I got there there were about 5 dogs guarding the spot. One of them was barking at me, but I decided to take my chances and keep on walking. Once I got to a certain point they all started barking at me and began to follow me. I heard their snarls behind me, but I just kept walking-- figuring that if I made any sudden moves they might do more than just bark. My plan seemed to work; they continued to follow me, but after a few minutes their barking died down and they left me alone. I decided to keep on going east along the river, since I didn't want to go back where the dogs were. The breeze really began to pick up. I don't usually like winter winds, but this I liked; something about it reminded me of winter back in New England. I came across a frozen pond, and at that point I turned around and looked back at the town, which was now well behind me. I snapped a few shots, and headed south. After walking a while longer I came across some kids sledding. They were pretty friendly, so I played with them for a while. From there I continued south, wondering where my path would lead me. Eventually I came to a road, and it just so happened that I had arrived very near one of the town's supermarkets. So, I stopped in, did some shopping, went home, and made an awesome shepherd's pie. All in all, it turned out to be a good day, even though I never got a shot of the mountain. Now it's time for some tea. I had some PCV friends over for the interim between Christmas and the new year. We decided one day to make egg nog. So, we went out and bought the necessary ingredients-- eggs, milk, sugar, cinnamon, nutmeg and cloves. Lacking a blender, I thought about how we might mix everything together. I decided to go to the hotel across the street and see if I could borrow something from their kitchen. However, my friend George wasn't in (he's the doorman who usually allows me to borrow items from the hotel kitchen). I decided to ask the lady at the desk anyway. I explained that I needed some sort of machine to mix liquid ingredients together. At first she thought I was a guest at the hotel, but after I explained I lived across the street and wanted to take the thing with me she got confused. The manager (at least I think that's who it was) happened to pass by at this point, and asked the desk clerk what was going on. She explained that I was in need of something to mix a drink. 'Simply bring the things down from your room and we'll mix them for you,' said the manager. I further clarified that I wasn't a guest, but simply a guy who lives across the street. 'Oh, you don't have a room here?' 'No,' I explained once more, noticing the conversation going in circles. In any case, it seemed extremely doubtful that they'd give me any sort of mixing device, so I left, still wondering what I'd do. Eventually I got a mixing device from my land-lady. However, there was still a problem. I had bought whole cloves, and didn't have any way to grind them. Suddenly, I remembered that I had a brick in my oven. 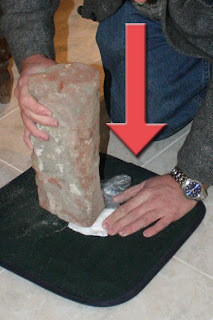 It was a giant brick I had taken from the courtyard of my building to use as a weight (I had made some stuffed peppers that were so stuffed that I couldn't get the lid of the casserole dish to sit tightly). It was simple; we'd use the 'whammo method,' one of the most ancient and trusted processes (see illustration below). So, we put the cloves in a plastic bag, carefully wrapped the bag in a paper towel, and proceeded to beat the cloves mercilessly. The caveman method produced finely pummeled cloves, which we added to the nog. In the end, perhaps a bit surprisingly, it tasted almost exactly like egg nog. Pretty awesome!